When the weather warms up and the air gets hot, common summer pests come out in full force. There are many different summer insects that will come into your home. With our professional summer pest prevention program, you can keep down any infestations before they become a real problem. There are many different insects that come out in our area when the weather gets hot and humid. It is important to have a professional pest control program in place to protect your home from all the bugs and insects that show up during the summer. Fire ants - Fire ants are known to bit and leave painful bumps on your body. Millipedes - Millipedes are not insects that tend to bite or cause damage. However, an infestation can cause odors. Acrobat ants - The Acrobat ant has a distinct heart shaped gaster; for that reason they are also called a Valentine ant. Argentine ants - Argentine ants are known to take up residence in your home, cracks in the concrete and other places where they will become a nuisance. Big head ants - These ants have workers that have heads that are proportionately bigger than their bodies. They live in logs and under rocks out in your yard. Crazy ants - Crazy ants are named this such for their erratic behavior. Florida carpenter ants - These insects have red and black bodies. They build their nests inside of wood. Ghost ants - Ghost ants have a back end that is a transparent white color with black head. These insects can become a real headache if they become established in a home. Pharaoh ant - These insects are quite a nuisance in your home and in particular medical care centers. They are small with light yellow or brown bodies. Rover ants - These ants are commonly found outdoors in moist or rotting mulch and vegetation. 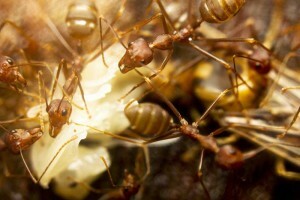 Usually, the best method of control for rover ants is a sweet gel bait. Ants are not the only bugs we deal with in the hot months. There are several other specific insects that you can infest your home in the summer time. Mosquitoes - Beside the painful bites and constant itching that mosquitoes bring, they can also be carriers of harmful diseases. Bed bugs - Bed bugs can infest your home during any time of the year. These insects live in and around your bed and bite you while you sleep. German roaches - German roaches are attracted to food and wet areas of your home. Fleas - During the summer, fleas are a real problem for you and your pets. Even after you treat your animals, the fleas can live in your carpets and furniture. Ticks - Ticks are very bad during the hot months. They get on your pets as well as your body. If you are dealing with these common summer pests, contact the professionals at Bug-Man Pest Control. With our specifically formulated pesticides and professional experience, we can take care of all of your summer pest problems. FREE estimate on all pest control, rodent and wildlife removal services.